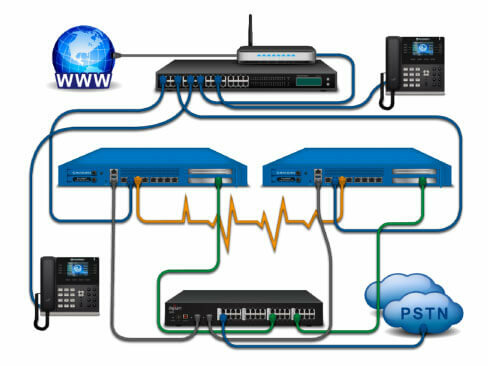 We recommend the Sangoma PBXact hardware solution for your on-premises phone system. We can supply, install and configure your Sangoma PBXact system to your specific requirements onsite. We can also arrange to deliver your system direct to your business and can carry out remote installation. We have developed an Outbound Call Limiting module that allows you to place restrictions on how may times a number is called during a certain time period. For example, if you have an outbound route for California-based numbers and have outbound call limiting in place on that route, the module would only allow you to make the allowed number of calls to any specific number in California. When exceeding the call limit during the specified time period, any additional calls would be blocked, and a recording would advise you that the call is not allowed. Supports up to 25 licensed extensions and 15 simultaneous calls. Supports up to 75 licensed extensions and 45 simultaneous calls. Supports up to 400 licensed extensions and 150 simultaneous calls. Supports up to 1200 licensed extensions and 350 simultaneous calls. Supports up to 2000 licensed extensions and 1500 simultaneous calls. Supports up to 5000 licensed extensions and 1500 simultaneous calls.